I’m not going to lie, I’ve been lazy with skincare in the past. I’m not proud of it, but I have neglected my face and not used any real form of skincare apart from a face wash that I continuously repurchased for years (despite not gaining any real benefit from it). I suffer with acne, its not terrible and I’m lucky because it could be a lot worse, but it still bothers me. I have a few stubborn areas and occasional flare ups. During a bad patch earlier this year, I’d had enough and resorted to making changes in my skincare. That’s when I discovered Mario Badescu Skincare*. I came across it completely by accident after searching ‘cleanser with salicylic acid’ online (I’d read something about salicylic acid and acne). A few different products came up, one of which, Acne Facial Cleanser*by Mario Badescu, took my eye. I think in honesty the reason it stood out to me was because it was stocked on Beauty Bay, a website I use all the time to order beauty products. I read some of the reviews and decided to give it a go because a) it was reasonably priced and b) my acne was the worst it had been for ages and I was pretty desperate to try something new. Beauty Bay recommends using it with the Special Cucumber Lotion* (also Mario Badescu), so I ordered that too. According to the brand, these products suit combination and oily skin, which I’d say sums mine up, so I was hopeful I’d made a good choice. A few days later they arrived and I began using them both daily, morning and night. I have continued this routine ever since and re ordered once so far (around a month ago), so I’d say they’ve lasted well. Although there isn’t a dramatic difference in my acne from these two products alone, I have definitely noticed my skin has changed for the better. My face feels smoother, softer and looks overall more healthy. It’s a brilliant start and I feel more confident than ever to embrace no makeup days! On my second order I also added the Drying Lotion*and Facial Spray with Aloe, Cucumber and Green Tea*to my basket. I wanted to expand my Mario Badescu collection and I’d heard great things about the Drying Lotion. After using it more times than I can count since I ordered it, I can confirm its amazing! I’m usually wary with products that claim to beat acne, mainly because I find they don’t work (sorry to be negative, I’m just skeptical), but I noticed a difference immediately. I’m not going to say your acne disappears, that’s unlikely, but for me it drastically reduced the size, colour and appearance. It essentially dries out the acne, but not enough to harm or dehydrate the skin. You apply it at night on the affected area, sleep in it and remove the next day. Side note: VERY attractive look, sleeping with pale pink drying lotion patches across your face (hawwt). I purchased the Facial Spray with Aloe, Cucumber and Green Tea on a whim, (as I was already reordering the other products) and it does what it says, it’s soothing and hydrating on the skin. I wouldn’t say it has any effect on acne (from my own experience), but I enjoy using it all the same and I would re purchase again in the future. It’s perfect for cooling down in the summer! To summarise, I would recommend giving these products a try if you suffer with acne or just fancy switching up your skincare. For me the price was reasonable enough to give it a go and I haven’t been disappointed. 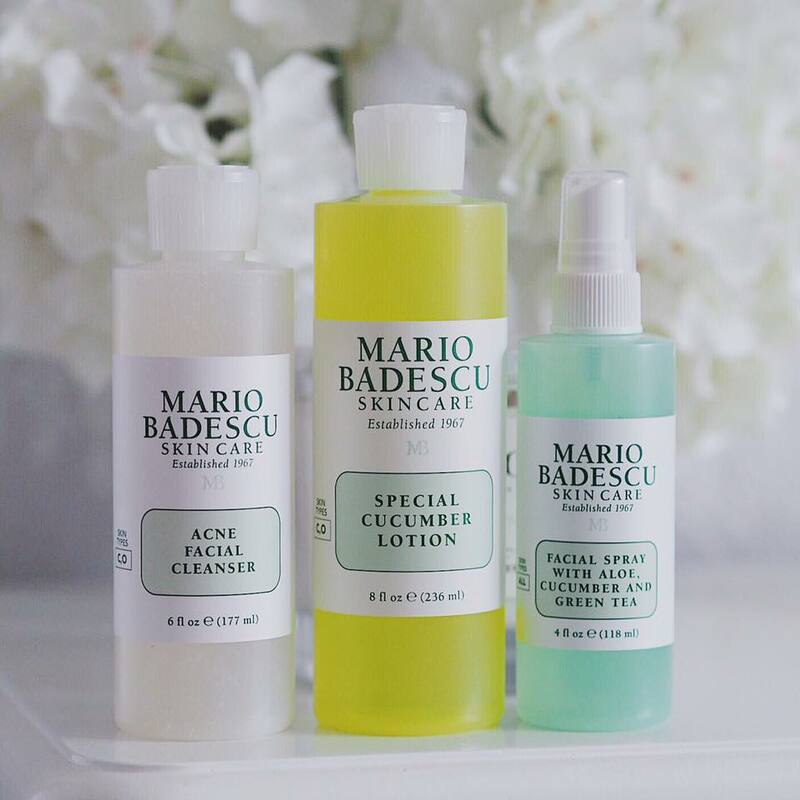 Have you tried any Mario Badescu products? If so, what are your thoughts? Or have you found another brand that works for you? I would love to read your comments. I am so obsessed with skincare. Loved this post, always wanted to know about this range.